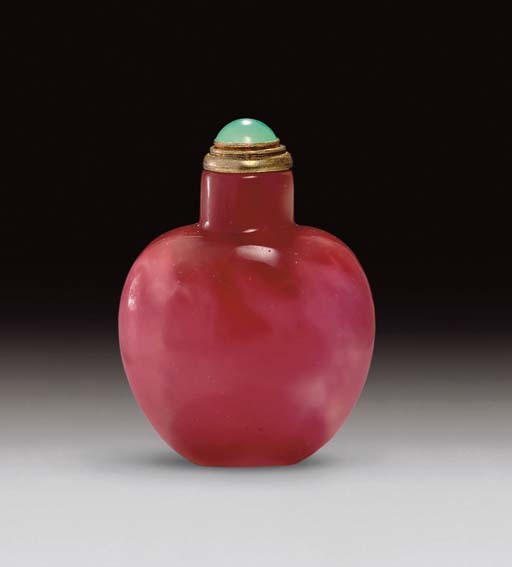 The shape of this bottle identifies it as one of a popular range which would have been mold-blown, and which were produced in large quantities at the Imperial workshops to be distributed as gifts on regular occasions. However, what sets it apart from the usual range is the unique color. The powdered glass would have been added to the surface of the inner layer and then scorched in the furnace, melting the fragments before the outer layer was added. The manufacture of such bottles would have been an adventure aesthetically, for although the glassmaker could control the colors and their general disposition, the effects of the fire and blow-iron could not be predicted with absolute certainty.